Many argue that the P/E ratio on the S&P 500 was higher in 1999 than it is now. But when there are no earnings, price does not matter. Many tech stocks in 1999 had no earnings, and never had a chance to produce earnings, because many of them went out of business. The 1990s tech bubble resulted in an 85% (roughly) decline on the NASDAQ. Currently the five highest-valued stocks are tech stocks: AAPL, GOOG, MSFT, AMZN and FB. Combined, these stocks make up nearly 10% of the total value of the entire stock market. Money poured into ETFs at record pace in February. The majority went to S&P 500 ETFs, which have to put that money into each of the S&P 500 stocks. When cash pours into funds like this, a large rise in the top five stocks becomes inevitable. Take Microsoft: Last Friday it hit an all-time high, despite the fact that MSFT’s revenues dropped 8.8% from 2015 to 2016, and its gross margin plunged 13.2%. In addition to the onslaught of retail cash moving into stocks, margin debt on the NYSE hit an all-time high in February. Both the cash flow and margin debt statistics are flashing a warning signal, as this only occurs when the public becomes blind to risk and bets that stocks can only go up. This is a dangerous stock market. Perhaps the loudest bell ringing and signaling a top is the market’s valuation of Tesla. Its market cap has surpassed Ford’s, despite the fact that Tesla delivered 79,000 cars in 2016 while Ford delivered 2.6 million. Tesla has never made money and never will. Next to Amazon, it’s the biggest Ponzi scheme in US history. Without the massive tax credits given to the first 200,000 buyers of Tesla vehicles, it would likely be out of business by now. The public has been seduced into throwing money at the stock market, chasing dreams of risk-free wealth. 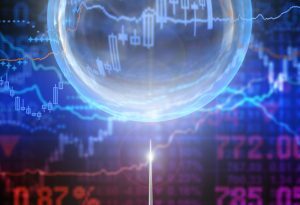 When this bubble bursts, 99% of them will lose everything. Only the biggest stock bubble in history is capable of enabling operators to reap extraordinary wealth at the expense of the public. The bell is ringing; the only question that remains is when.